Dedicated aqua equipment manufacturers in the trade. Taiwan aqua CO2 system manufacturers. Choose Master Regulator to be water plant Master Master Series SO-02 CO2 Solenoid Regulator (Double Pressure Manometers) Usage Details: 1.Ensure that the regulator is connected securely to the CO2 cylinder, and placed on a stable level ground. 2.Please do not apply lubrication to any parts of the regulator. 3.Other than changing the CO2 cylinder, please do not attempt to change any parts of the regulator on your own. 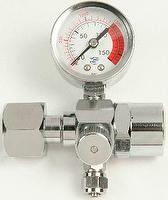 4.Our regulator is able to prevent all backflows, especially when the pressure inside the CO2 cylinder is getting low. This will prolong the operation and life span of the CO2 cylinder. The price is without shipping charge. 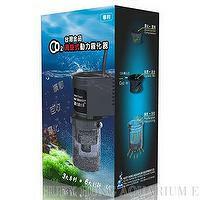 Outstanding aqua co2 system manufacturers. 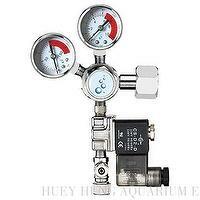 Precision CO2 Relieved Regulator Easy to limit CO2 lever. Precise, refined, light 1. Precision structure, durable stainless steel inner part with aluminum alloy to release CO2 by fine tuning. 2. Ergonomically designed, easy to install without using any tool. 3. When replacing the CO2 cylinder, you must first remove any CO2 still in the regulator by opening the valve. 4. Connection part can be rotated at will, easy to read the meter without directional limit. 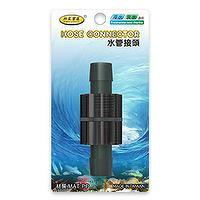 Suitable to Marine, cichlid aquarium, restrain the water acid-drop. Porous biological technique filter material, special design to cichlid, guppy and marine ornamental fish. Characteristic: 1.The abundant calcium, magnesium, sodium….ions are liberated from technical porous cavity structure to aquarium to balance the pH range and clarify water quality. 2.The technical porous cavity structure has great features of lightest gravity, largest surface, high permeability of water and air to culture the nitrifying bacteria and microorganisms. 3.Special water movement design to capture suspending particle and enhance biological decomposition. The bio-film fall off easily and regenerate the new microorganisms filter film. 4.The material is produced in weak alkalinity to restrain the acid water then balance the pH and KH of water. 5.Magic baby Living-bacteria Pack is prepared with the Porous biological technique filter material. This pack contains multi-function benefit bacteria and reproducing elements to restrain germs and algae, promote the immunity of fish; establishes stable water quality and well growth, reproducing circumstance. Usage: 1. Pleaase put the material in filter and use the fiber sponge as the pre-filter material. 2. Please use it with Expert’s Choice Multi-function Filter Material—light type to make the great filtering when used in trickle and large surface filtering. 3. Depends on different material quantity use and fish population; suggest changing half of the biological filter material each time rather than entire one to avoid severely impacting biological filtering system and water quality. 4. Please keep it away from children.